Up until the mid 17th century, as a general rule if you were invited out to dine, you brought your own knife and spoon with you. 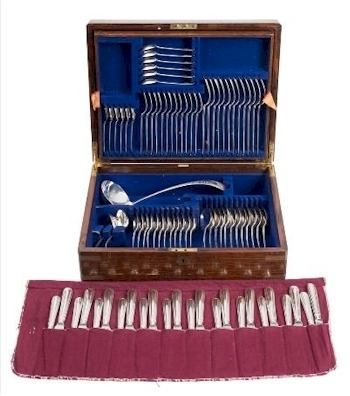 The introduction of a flatware service did not come about until the restoration of the monarchy in 1660. On the return of the King Charles II from exile in France, the fork was introduced as an eating implement as was the custom of setting the table for invited guests. An Elizabeth II Silver Fiddle Scroll and Shell Pattern Flatware Service, Maker Mappin & Webb, Sheffield, 1967/70 (FS40/45) realised £1,600 in one of our Fine Art auctions. The generally accepted definition of what constitutes a flatware service is as follows: 12 table spoons, 12 table forks, 12 dessert spoons, 12 dessert forks and 12 tea or coffee spoons. Knives are not included in the service for two reasons. One they are cutlery and not flatware. The other reason is that they were introduced into services at the end of the 19th century and it is more often the case that modern knives are matched to older services. These early services often bore the crests of their owners. Not only did this show the importance of the person at who's table you were dining, but also established who owned them and that, on leaving the dining table, the flatware was to remain there too! A George V Silver Old English Pattern Flatware Service, maker George Jackson & David Fullerton, London, 1910/11 (FS40/57), always popular and sold for £1,800. Early patterns included Trefid, Dog Nose and Hanovarian. Forks generally had three tines and it was not until late in the 17th century that forks acquired a fourth tine. Patterns continued to develop with the introduction of Old English, Fiddle and Kings and from these sprang many adaptations with shell, thread and feather decoration. Other flatware was produced during the 19th century to cope with the ever increasing variety of foods that were being consumed. 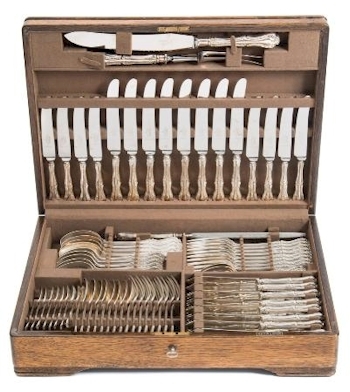 Fish servers, together with fish knives and forks, came as cased sets; asparagus servers and tongs, fruit knives and forks, serving spoons, cake slices, sauce ladles, soup ladles, sifting spoons, marrow scoops, pickle forks and caddy spoons all form part of the flatware category.